Are you popular or a nerd? I got nerd. It told me that I should talk to people more because they think all nerds are shy. Also, why try to be popular? At school everyone knows about me liking vocaloid, anime, and stuff that is not popular in school. I dont care if I fit in or not. I already have one friend, which makes me happy enough. Plus I have everyone on ff with me. Most of the populars at my school are jerks anyway. I agree! Who cares about being popular??? One of my friends that goes to another school wants to be popular, though she wants to be the nice kind with lots of friends...not the mean ones with cool clothes. People care about being popular because they like to feel like they're important, like people like them more than they like the larger "unpopular" crowd. They dress and act the way they do so that they don't lose the friendship of the other popular guys and become unpopular again. As a permanent member of the geek group due the fact that I'm pretty socially awkward in real life and don't have friends, I really don't see the point in becoming popular, but for some people the popular group are their only friends.  They'll do whatever it takes to stay within the circle, even if it means being annoying to the others. Yo guys you shouldn't take these things seriously. It's probably made by a pre-teen girl who thinks that real populars and nerds/geeks are just like the stereotypes. eh, i landed geek/nerd. the quiz seemed a bit irrelevant in my opinion. there's nothing wrong being a so called "geek." i'm not even considered unpopular at school. i'm practically known and am friends with everyone. but anyways i don't really believe what that quiz said about me, lol. people try so hard to be popular when really there shouldn't even be something about popularity. idk how to explain but i think it's good to just be yourself and not "change your ways" to please everyone else. They got me all wrong. The real reason I am unpopular at school is because I talk too much, I am very loud (I dont scream, that is how my voice just is) and because sometime my ears hurt super bad because I can hear a little louder than other people. That quiz just supposes that all nerds are like that. But yeah, this quiz is mostly likely aimed for preteen girls (probably made by a preteen girl as well), so you shouldn't worry too much about what result you got! c: Besides, these kinds of quizzes are hardly ever accurate. Just saying. At my sister's highschool all the ninth graders were more interested in crack than anime.. But yeah, these quizzes don't even work. Maybe every now and then they'll be accurate, but you can't rely on them 100%. meh, whatever. i don't see the problem with being a nerd/geek, so okay, haha. the result (like the description part) was a bit disappointing to read, though. I got popular. There's one thing that I don't understand though. Am I also a nerd/geek because I see another red bar. 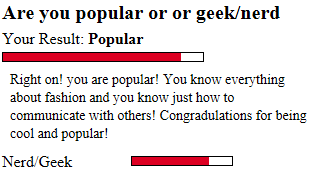 Subject: Re: Are you popular or a nerd?